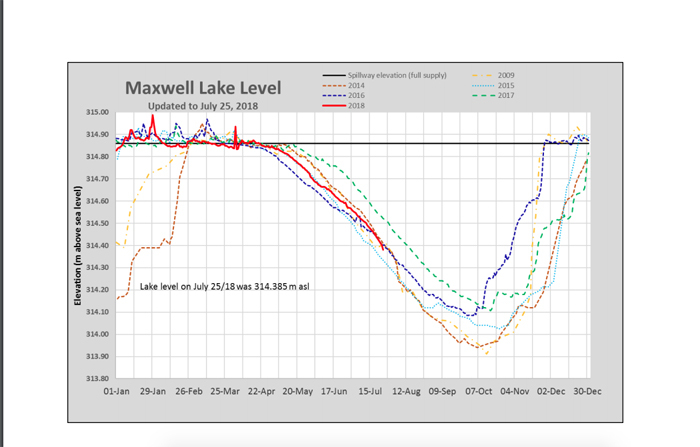 Maxwell Lake level as of July 25, which shows it at a much lower level than 2017, which is the green dotted line on the chart. The North Salt Spring Waterworks District is hoping to eliminate confusion through an update of its hook-up moratorium policy. District manager Ron Stepaniuk explained that the wording of the previous policy made it sound like “a waiting list” could exist, which made people erroneously believe they might receive NSSWD service at some point in the future by being on a waiting list. No such list exists under the moratorium. “It is simply a matter of clarification,” Stepaniuk said about the policy update. All property owners who currently pay a NSSWD parcel tax on bare land still have the right to a water hook-up for a single residence or commercial unit. NSSWD trustees passed the amendment at their July 26 public meeting. The policy and its rationale is on the NSSWD website. Despite Salt Spring Island receiving ample rainfall in June, St. Mary and Maxwell lake levels are dropping rapidly, reported McKee. As of July 25, Maxwell Lake was just below the 2009 level but still above the 2015 level, which was the lowest since levels have been recorded in detail. “We’re not in great shape,” said McKee. “We may be going to Level 4 [restrictions] this year,” she said. The district is currently at Level 3 restrictions.